Though we usually feature an adoptable shelter dog or two on Sundays, today we feature a dog adoption issue for a whole group of dogs. Retired military working dogs. In celebration of Memorial Day, we want to call your attention to a bill now before Congress. The Canine Members of the Armed Forces Act would ensure that our nation's military working dogs (MWDs) are respected and cared for in their retirement. This bill reclassifies military working dogs as "canine members of the armed forces" instead of "equipment," and ensures that responsibility for the health and well-being of the dogs continues after their retirement from service. In addition, it's important to note that no additional federal funds would be used to provide the dogs' veterinary care. This legislation recently passed the US House as part of a larger military policy bill. Please contact your Senator and ask them to cosponsor S.2134, the Canine Members of the Armed Forces Act. You can do this very easily at the ASPCA Advocacy Center (www.aspca.org/militarydogs). Military working dogs help keep us safe and perform important work around the world. 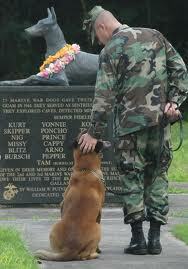 We share this tribute to military working dogs and their handlers and wish you all a peaceful Memorial Day. It would be so nice to see the military dogs get the respect and recognition they so deserve! I am with Bassetmomma, sharing! Military dogs make great pets if properly reintroduced to peacetime society. They can also perform useful service in civilian life. How y'all doin'? Just stoppin' by for a visit. Hope y'all are having a wonderful Memorial Day holiday weekend. Thanks for sharing the info on this one! This is awesome! I love the idea and intend on contacting my representative. Oh and I'm sharing it on facebook too.